After Milan's tumultuous 4-2 loss to Inter, and Juventus's 2-0 win against Cagliari, I sent a quick email to a close Juventino friend of mine from Italy, congratulating him on a well-deserved Scudetto. His response was emphatic, eloquent: "End of nightmare!!!" As the depravity of Calciopoli assailed Serie A fans six years ago, as the Bianconeri's long-faithful--and long-unfaithful when considering Luciano Moggi's instrumental role in the match-fixing--exited tearfully, defiantly, disgraced, and broken, one got the feeling that the club's very identity was at stake. The last six years have indeed been a sort of nightmare for Juventus, relieved only by a motivational sense of indignation and injustice--however unfounded. The overwhelming feeling that Juventus were punished too severely has sustained the club through a time that has seen their two main rivals, Inter and Milan, win Scudetti and European Cups. Most gallingly, in the case of Inter, Juventus's most despised rivals, domestic superiority between 2007 and 2009 owed a lot to Zlatan Ibrahimovic, a former Juventus player brought to the club from Ajax by Moggi in 2004, but one who left to Inter when Juventus were relegated to Serie B after the scandal. Now, finally, there is some redemption. For all of their past faults, Juventus are pointing the way forward for the whole of Italian football. The club's first Scudetto since 2003 (or 2006 depending on your perspective) comes in a season at the start of which they unveiled their very own stadium, a state-of-the-art facility that has consigned the cavernous Stadio delle Alpi to a distant memory. Juventus are the only club in Serie A, and one of two in Italy (Reggiana being the other one) to own their own stadium. Admittedly, business sense does not always equate to on-pitch success, but Juventus's season has been a sort of homage to their fiscal foresight. It is almost as if their success on the field is an inauguration of a modern era: Juventus are not only winning, but they have laid the commercial and financial groundwork to keep on winning. "What they have done in Turin cannot be repeated in Milan," said Milan vice-president Adriano Galliani this season. "We cannot build a stadium here, but for now we can renovate the San Siro." Not what Milan fans wanted to hear. The San Siro is becoming a hollow, sun-deprived anachronism. A part of its turf is denied regular light due to a tier built during Italia'90, and the results of that architectural blunder have been embarrassing for the club, as both Arsenal and Barcelona complained very publicly about the patchy field. Encapsulated in the state of each of Milan's and Juventus's stadium is the narrative of this season. While Juventus boss Antonio Conte did revert to the conspiratorial this year, pathetically blaming the referees for being afraid to give Juventus decisions, he pioneered a path forward for a side that had finished seventh the last two seasons. "Remember," said Conte in the wake of any mishap or slip during the season, "we were seventh only last year." When you consider how marginalized Juventus have been from the title race since 2007, Conte has done an incredible job to steer them to a Scudetto. Milan, on the other hand, capitulated to a languor, a post-Barcelona arrest that came as a result of an exhausting Champions League quarter-final. It was a hangover that cost them everything. With a month to go in the Scudetto race Milan were ahead of Juventus with a much easier run-in. However, a loss to Fiorentina, a draw to Bologna, and a humiliating 4-2 loss to Inter on Sunday buried their challenge in a heap of stupidly concocted excuses, old ideas, and old players. "That one incident cost us," maintained Milan coach Massimiliano Allegri often this season. The "one incident" was the Sulley Ali Muntari goal against Juventus that was shockingly disallowed. That game ended 1-1 and at the time Milan had a point to complain. But since that incident Milan have been fundamentally incompetent. They simply didn't deserve the title. Their record against the 'big' teams this season was atrocious. True, they were playing two competitions, while Juventus were essentially playing one. Also true, they had the most injuries of any team in the league, and Juventus the least. However, that is precisely my point: Milan's loss of the Scudetto this year is a clamorous defeat of their system, their philosophy. We heard many things about the vaunted Milanlab, but the injuries kept piling up. "It cannot go on like this," Zlatan Ibrahimovic said after Thiago Silva, foolishly risked in the Coppa Italia by Allegri, was ruled out for more than a month. "Something has to be done about the injuries." We heard much of the commitment of the senatori, but they looked jaded, glaringly past their sell-by date. For one telling example, Clarence Seedorf played with a disgusting sense of entitlement, petulantly reacting to being substituted late in the season in the game against Bologna. Seedorf's attitude was only so bold because the club has allowed old players generous contracts rather than showing them the door. It may sound callous, but it is the only way to run a football club--and keep key players happy. 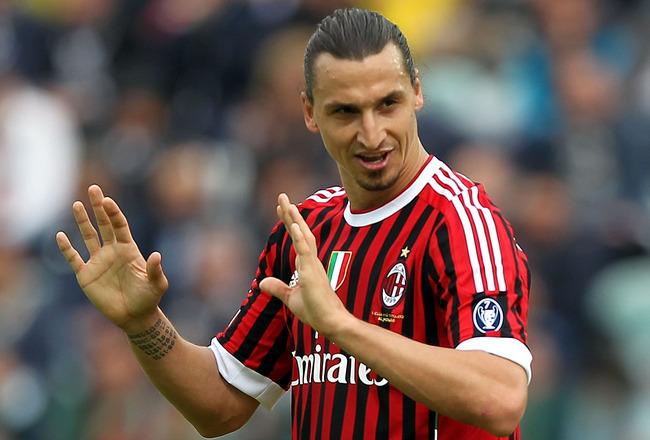 "I was told we were making a Grande Milan," said the begrudging voice of the club, Ibrahimovic. "Let's see if they are still interested in doing that." Ibrahimovic heaved sighs throughout the season, but he did his part and then some: he has already scored 28 league goals, and he was ubiquitous against Arsenal in the Champions League second-round first-leg. But playing behind him throughout the season were players who couldn't even provide service, the partnership, the collegial inspiration that he wanted and deserved. Antonio Cassano did only occasionally because he was out with a heart problem for a long part of the season, while Kevin-Prince Boateng was injured far too often. Ibra must be tired. He must be tired of an old system with old players. It is not only that Arturo Vidal lines up for Juventus in midfield while Massimo Ambrosini does so for Milan; it is not only that Juventus won the key games of the season; it is not only that Juventus have stayed unbeaten thus far; and it is not only that Milan suffered untimely injuries. Juventus's win was also a vindication of their modernity, their rejection of complacency, their good work in the transfer market. When asked if Milan would be signing top players this summer, Galliani replied idiotically, "we already have two in Ibrahimovic and Thiago Silva." The former is being pursued by Real Madrid, the latter by Barcelona. Both will probably stay this year, but both will want guarantees of a competitive team. Milan's attitude is even more bizarre when you consider that they are still, despite Juventus's new stadium, the team that earns the most in revenue in Italy. However, it is their failure to adapt to the changing landscape, their failure to bring in players who can complement the likes of Ibra and Thiago Silva that may prove disastrous for seasons to come. Juventus have the momentum now, and with Champions League revenue, they will buy key players. The club from Turin, maligned in recent years, has done it the right way, and they are at the top of Italian football again. And it is up to Milan to prevent the Bianconeri laying down a hegemony over the league for seasons to come.